You can probably guess which shirt I'd want! Click each picture to see the respective shirt, or click the link above to see all of them! Return of Pokemon of the Week! Hello everyone!! I apologize for the absence of this weekly theme. Life had gotten pretty busy, and all the curveballs life throws at you always seem to happen at once. But I really miss making the weekly Pokemon of the Week post, so here we go again! Randomizer.org will pick for us a random number, and this week's pokemon is...! #5, Charmeleon!!! Which of course includes Charmander and Charizard too. :) Rally up your fire lizards and take pictures of all the items you have!! 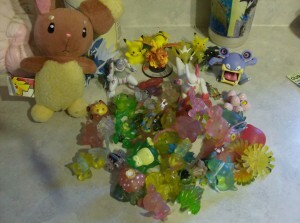 I know I have a couple items of charmander, so I'll see if I can get a picture posted here sometime this week. 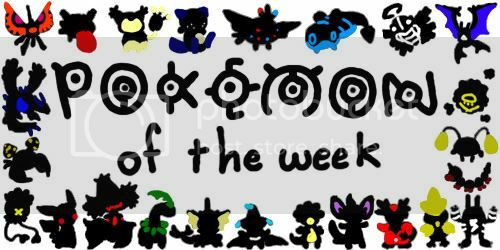 Share your photos, stories and merch info on these guys and give it up for the Pokemon of the Week!! Lately I've been wanting more Wooper things. I've always been a big fan of Wooper and Quagsire -- I did a short webcomic about a guy and his Wooper one time...(but I am a little ashamed of the art and never got too far with it). Whenever I can I have a Wooper in my party. I wasn't as big a fan of Quagsire until I let the Wooper in my party evolve (for the longest time I gave it an everstone because I was so attached to it). Also, does anyone know if there is an official Magnezone plush? Hello! I have some news for you guys! Quick Re-Intro and Northgate Mall Kiosk Update! So... it's been a while since I last posted here! The last couple of months have been extremely hectic. I graduated from college, moved out of my apartment back with my family in their house... only to completely move out again all the way to Seattle (I'm originally from California)! I'm still in the process of unpacking, looking for a job, and all that fine stuff you do when you move to a new place, but things are finally calming down to the point where I can get my daily PKMNCollectors fix! 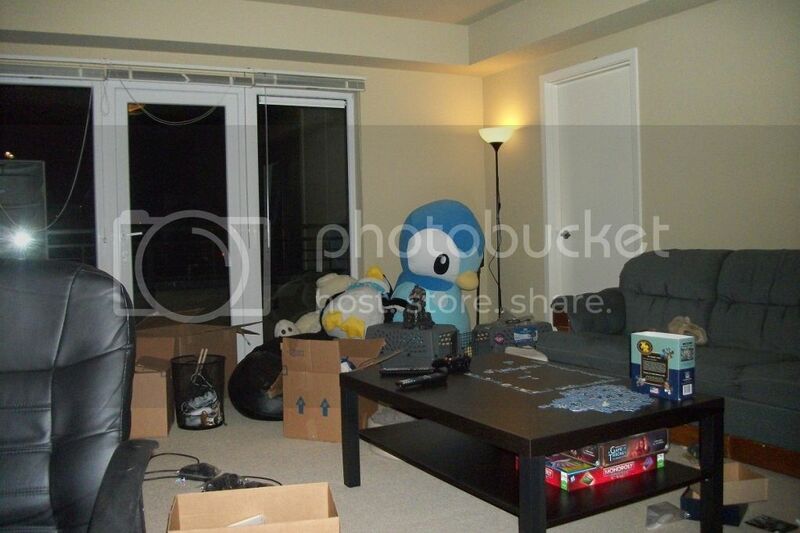 Giant Piplup says hi from our new apartment! And finally one last thing. Since I live in Seattle now, I took a little trip to the Northgate Mall this weekend. Besides all the typical stores there I looked at, I also glanced at the kiosk! 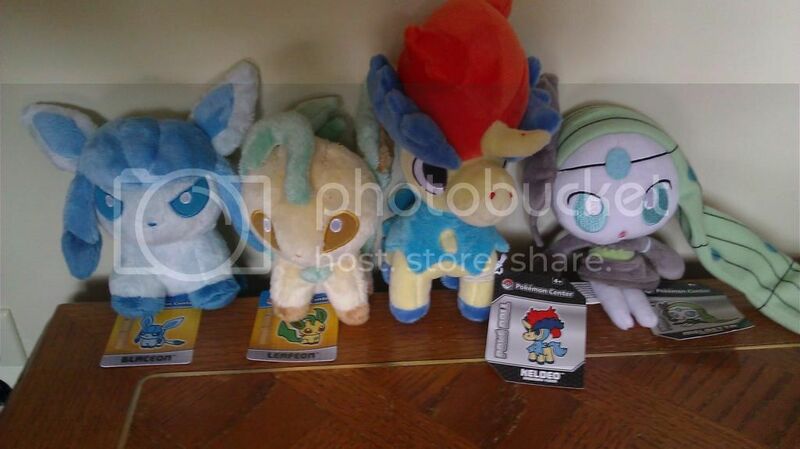 I was surprised to see that they had Glaceon and Leafeon pokedolls! I couldn't remember 100% (and I'm still not 100% sure), but I remember reading that Glaceon and Leafeon pokedolls had never been released in the USA before. Someone correct me if I'm wrong though! I hope to start participating more in the comm once I settle down! I have been lurking every now and then, and it's nice to see this community grow, and I hope to be a part of it again! Zekrom Galore GA extras - now opened to non-participants! So, all participants of the Zekrom Galore GA have had a go at picking extras they wanted, now it's your turn! I believe there's still over 100 items left so here you go! Please make sure you read everything before requesting as I want to keep it as organised as possible. If you don't I might not reply to your comment. If you can let me know whether you are happy to take whatever is available, or if you only want something if something is available that would help too! When requesting, please include the picture number, items wanted and calculate the total cost for the extras BEFORE PP fees. You can also combine with my regular sales if you want! All prices already includes shipping, I ship from Hong Kong worldwide by airmail. Airmail takes around 1-3 weeks depending on where you live. Please note that I work full time and study part time so I have very limited time at home to pack things and I can only go to the PO on Saturdays. If you have any concerns about international mail please add $2 for registered mail (includes tracking). Make sure you mentioned about that in the memo on paypal if you do so! First, payments for the Quick pan sticker GA is due! The rest of the pan stickers are up for grabs for both participants and non! Please read the rules first before paying me! Gin described the problem...the second photo was just a commercial or teaser, describing in Japanese: "Look at photo 2 for other seal holders I am auctioning separately." Gin and the other mods are talking through this what to do with it....I will keep you guys updated of course. I just wanted to make an announcement that everyone could see. The Delibird GA has not gotten to me yet, as it is coming from Australia to my home in New York with Sea Mail. I cannot make it come any faster, and I'm really just waiting for it to come to my door step. Two people have opened disputes with me about this, and I have gotten zero contact from any mod or member about it before hand. If anyone has questions or concerns, I am here to answer and talk to you. Edit; I didn't specify before that it would be sea mail, and that is my fault for not saying so. But I did post something saying that it would be a while to get here in a previous post. Another edit! : The disputes have been resolved, and all is fine. But I'd like to keep this up here so everyone knows whats up with the GA! Hello fellow Pkmn nerds! I am here with my first collection update since I joined the comm. : ) I have quite a few things I'm still waiting on in the mail but I thought I'd like to show you guys what I have so far. You'll notice that right now I'm incredibly disorganized. I hope you can forgive that. o uo; Anyways, collection awaits! I come to you with some super quick sales! Sorry to post so soon but... I was super excied about this. I never thought I'd find one of these!!!! Today I bring you a variety of things. 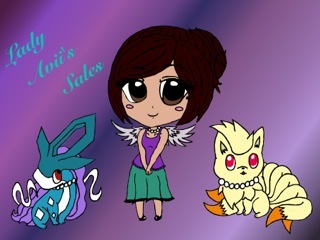 I have my first sales post, as well as some auctions, and custom slots. 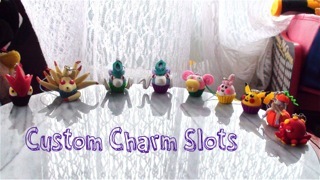 First off Custom Charms Sales and Slots! Next are the Auctions I have. 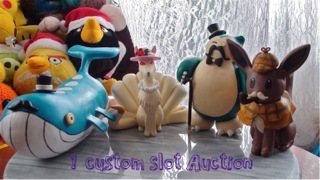 I am auctioning off Lord Wail, Sherlock Eevee as well as 1 custom sculpture slot. I am only do one slot for now, to see how things go. I may only do a few slots a month. I'm trying to get a feel for how many people would commission me, as well as a price range for my sculptures. Any advice is welcome! Auctions end Thursday, October 11th @ 5pm HAST. Please click photo or >>>HERE<<< for Auctions. Finally my first sales post is up. Click >>HERE<< or photo above. Sorry for posting again so soon but I need these questions answered. 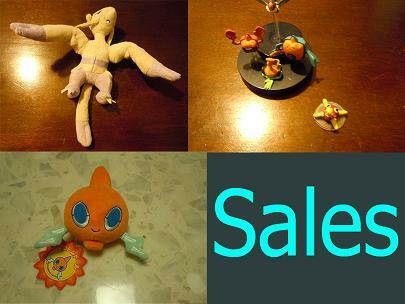 * How much is the original price for canvas plush in the pokemon center if you visited it? * And are canvas plushies only sold in the pokemon center? * In the uk what shops can you find pokemon stuff in other than toys r us? Quick sales! UPDATE: Charmander Items! Hey PKMNCollectors! I'm moving house soon and changing my collection around a bit, so here's some weeding sales for you! Since I'm moving soon, I'd love to have this stuff outta' here relatively fast. So I've priced everything to include shipping within the US. 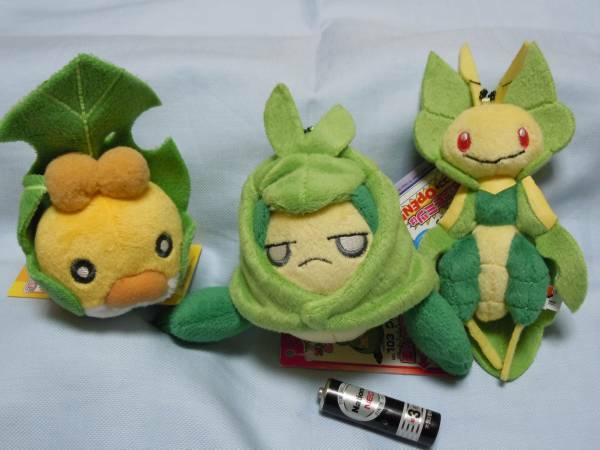 There's some Breloom stuff (including a Zukan! 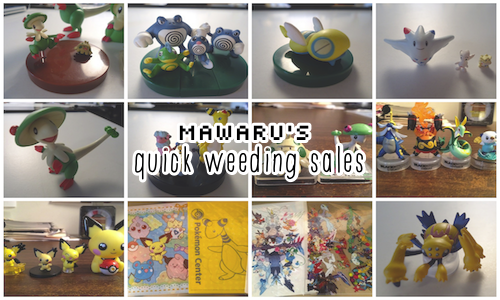 ), some other Zukans, figures and a few clearfiles -- including the BW2 Release clearfile and the Year of the Dragon clearfile, both of which were fairly popular! Anything not sold here will probably go to Ebay, so grab 'em now if you're interested. I do apologize for the huge list.. x.x i just figured that a lot of these wouldn't be available at the moment.